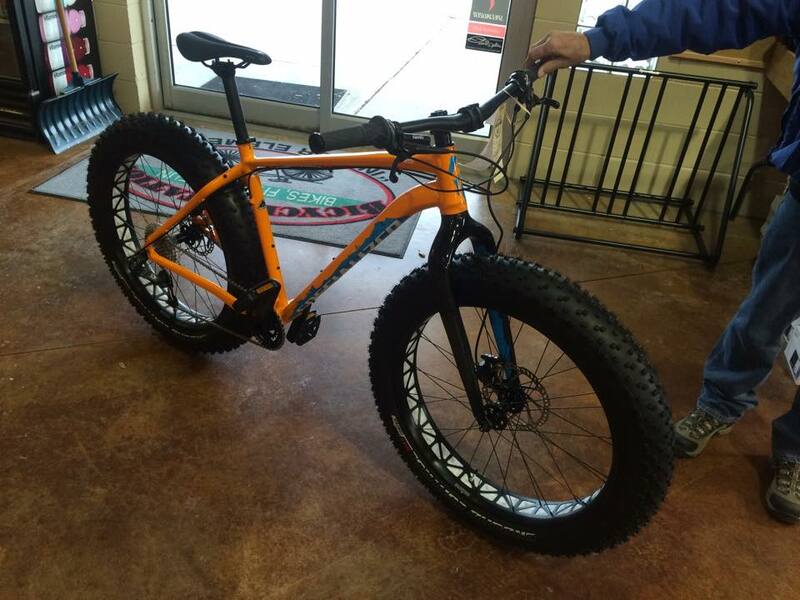 Yes, I needed a stinkin’ fat bike! I had a blog post from back in February 2013 claiming I didn’t “need to own no stinkin’ fat bike.” I swore up and down I wouldn’t own one because it was too “specialized” of a bike and that I wouldn’t enjoy it or use it enough to justify one. Fast forward to November 2014 and one of our only snowy weeks so far this fall/winter, and as I was driving home from work I told myself, “Damn, I really want to go for a bike ride” and frowned at the idea of taking the Fate or Epic out on the icy and snowy roads. Ten minutes later I was researching fat bikes on my laptop and the very next day walked in and purchased one. Just like that! I wanted a tank I could treat as a toy, nothing with pricey carbon fiber and XTR parts that cost an arm and a leg to replace. I wanted an option to get outside and off the trainer during the winter and those early spring months where I’m antsy and have cabin fever. My very first ride on “Carlos,” my 2015 Specialized Fat Boy, was also my very first night ride. Talk about a learning curve! I couldn’t believe how hard of a work out it is. I was out of breathe and my legs screamed! A couple days later I went out for about 3 hours with another friend, and pretty much hated life. It was hard. I was walking stuff that I shouldn’t have been walking. I fumbled with the flat pedals after riding clipless nearly the entirety of my mountain biking experience. I started to scheme up ways to sell the bike to recoup some money from this “stupid decision” I made. I felt like a newbie that had never touched a bike before, not the Cat 1 XC racer I am. It was humbling. The only redeeming quality was descending. Descending on a fat bike is one of the most confidence inspiring things! Then came Thanksgiving and I had a few days off work so I stayed over in Laramie at my parents’. Time to give the fat bike another go. And whoa – HERO SNOW. The trails were perfect. I was more comfortable on the flat pedals, especially with climbing. Though it was still hard, I was flying up and down the trails, I had my mountain biking mojo back! I was amazed at how easy climbs that challenge me in the summer months I could ride up on the bike and how easy technical features and rock gardens seemed. My favorite thrill has been descending Haunted Forest, a trail I haven’t ridden since the early days of biking in the summer of 2012. In the summer it can be a muddy muck fest, but has a few techy rock gardens, and a decently steep rocky drop in at the top. It’s been my personal race track on the Fat Boy, and I’ve now come within a minute of my favorite pro’s, Georgia Gould, time on Strava (because it’s all about the Strava)!! Granted with the snow there’s no muck, but there’s still a few spots I have to finesse to stay upright, and the tricky rock garden, which I cleared for the first time ever. 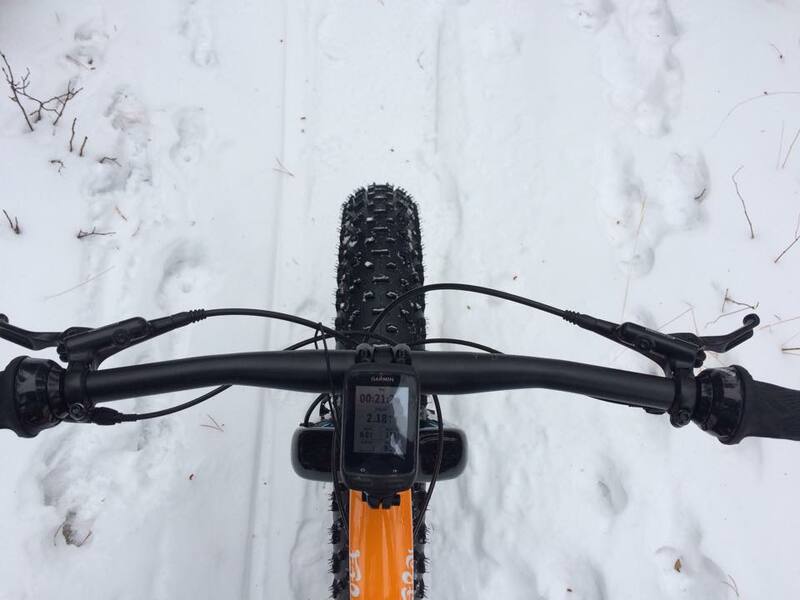 My three rides over Thanksgiving ignited my love for fat/snow biking. It showed me what perfect snow conditions is like, and the capabilities of the beast of this bike! I’m use to a 20 pound carbon hardtail, and I had to rewire my brain to embrace this 35 pound beauty for it is! The Fat Boy just monster trucks over stuff and chugs up hills like a little diesel engine that could. I’ve cleared several climbs that I struggle with in the summer even! Skinny Fate, meet beefy Fat Boy! 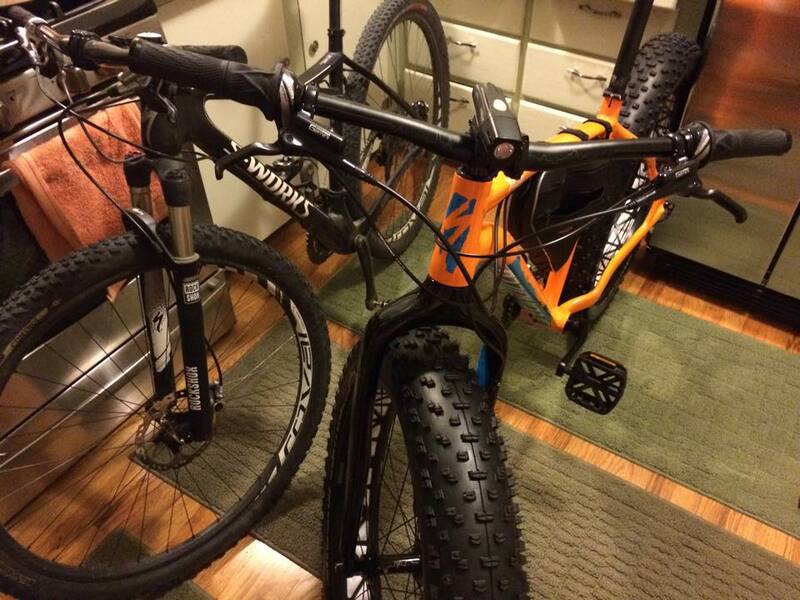 Trying to work out a rough bike fit in my kitchen… never mind the fact the Fat Boy takes up half my kitchen! 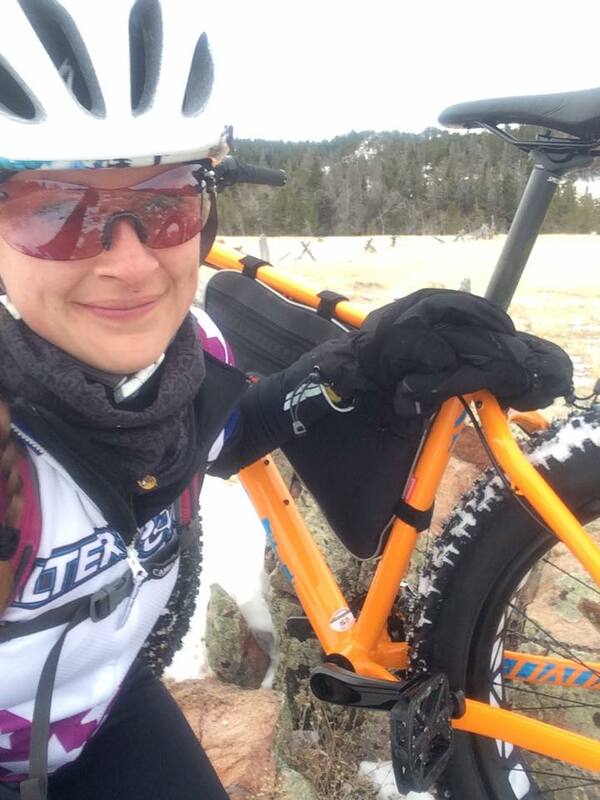 This past weekend my friend Jon and I joined Melanie, one of the gals I’ve spent a lot of races with, for her first night ride on her fat bike up at Happy Jack. We tackled Death Crotch, which is a whole ‘nother experience at night, on fat tires, and in the snow! We saw the full moon rise at nearly 9000 feet in elevation, a deep orange on the horizon. Though both Jon and I were cooked from high miles and racing (me), we enjoyed the ride. I could’ve been at home on the couch, but thanks to my impulse decision to buy a fat bike, I was out experiencing awesomeness! I found a cheapy frame bag on Amazon for $15 that I got for storing a spare tube, tools, water bottle, and my battery pack for my handlebar light. I also picked up some Dogwood Designs pogies in neon pink to keep my hands toasty. I’m debating changed the pedals since I’ve gotten use to flats. I do not like how much my feet can get bounced off on technical terrain, but I’ve also gotten really use to cornering and using body English involving sticking feet and legs out so I worry about being connected to the bike, so that’s something I’ll just have to wait and see. I did order some Sidi winter riding boots, but they have a treaded sole like a hiking boot so I might not necessarily have to change to clipless to still use them. Otherwise I’ve gotten the winter riding clothes down, and often find myself on the warmer side of things – which is great, I’d rather be warmer and than cold! Luckily I didn’t have to buy any clothes, aside from some Patagonia thermal long johns I got on sale from REI that I wear under my therminal Specialized tights. So far my Keen hiking boots have been doing a good job at keeping my feet warm along with snowboard/ski socks I had shoved in the back of my closet from my downhill skiing days. My lights are NiteRider Lumina 750 and NiteRider MiNewt Pro 770 Enduro, which are mostly purchased for 24 Hours of Old Pueblo, but will do double duty on the fat bike in this dark winter months. I wanted an ’15 Epic Expert WC in the satin Gallardo Orange, but settled for the Fat Boy in the gloss Gallardo Orange. Same thing, right? 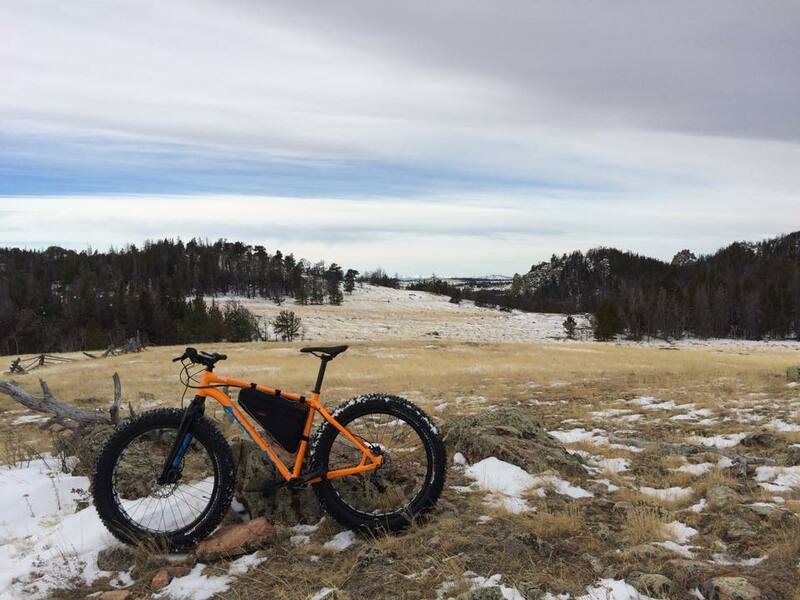 Though Curt Gowdy State Park is grooming fat bike trails whenever they get snow (the regular mountain bike trails are snow free and still very rideable, even though it’s mid December), I’m finding Happy Jack is the place to go! 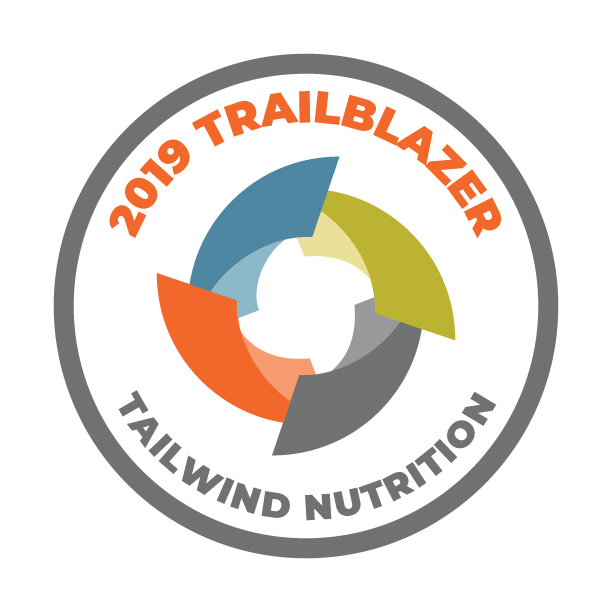 So much winter-only single track has popped up through the packing activities of some amazing riders from Laramie, and trails like Headquarters, Crow Creek, Pole Creek, Death Crotch, Haunted Forest, Aspen, Bypass, and others are packed as well. Happy Jack is traditionally a cross country ski venue in the snowy months, but I’ve found I’ve had no conflicts with other trail users since I don’t ride on the groomed XC ski trails. With so much awesome single track, the XC ski trails are honestly kind of boring! I’ve always seen more fat bikes up there than skiers anyway! So I’m quite spoiled that my home mountain bike trail systems are also awesome in the winter. 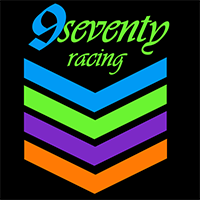 Most of all, I’m just happy I gave something a try, even though I had previously found it silly and not of use to me. I know staying on a mountain bike, even it’s a bit different than my XC bikes, will keep my skills sharp and also my body in a bit of mountain biking shape over the winter! Next postIs it really December? !